Above - Athearn has released all five ATSF SD45-2s in the "Bicentennial" scheme, 5700-5704. The SD45-2 addressed the radiator problem of the SD45 by replacing the three section angular mounting with a longer radiator area, almost four feet longer than the SD45, divided into two sections with three widely-spaced fans. The SD45-2 was mounted on the same frame (68' 10") as the SD40-2 with the cab centered over the middle axle but lacked the long end platform. 2 5706,5707,5712-5714 delivered with EMD's experimental inertial radiator fan air intake grilles. The anti-climber style dictated which SD45-2s received coupler lift bars with loop on the locomotive front pilot and which SD45-2s were capable of being retrofitted. This table identifies and summarizes Santa Fe's SD45-2 front anti-climber, coupler lift bar, radio antenna, nose classification lights, head light position, step tread edge color, the "Santa Fe" billboard lettering style, and truck side frame color details for Santa Fe's as delivered SD45-2s and those units later re-painted. Replacement of the can-type antenna with a Sinclair antenna was also begun about this time on the Santa Fe first and second SD45-2 orders. The 5679 and 5682 (from Athearn's August 2007 release) are painted in the SPSF "Kodachrome" scheme. From the third order are the 5707, 5709, 5712 and 5713 with the medium-width front anti-climber which is correct for Santa Fe's third SD45-2 order. Models of Santa Fe's first two SD45-2 orders have the correct can-type radio antenna mounted on radio platform. Rear detail includes a horizontal mounted headlight, number board outlines (which Santa Fe's SD45-2s did not have), low-mounted classification lights (only the first SD45-2 order had these), outlines for upper classification lights, single walkway mounted MU receptacle, and drop-step. The Athearn models of ATSF 5707, 5712 and 5713 from Santa Fe's third SD45-2 order have a good representation of EMD's experimental inertial radiator fan air intake grilles but they should have had a more built-out effect than what is modeled. The Athearn model of Santa Fe's 2nd SD45-2 order has the small air vent mounted vertically on cab side below the front of cab window on Engineer's side which caused the unit number to be noticeably off center just like the prototype. The road number is painted white on the red cab sides, and a small white road number is painted on the blue rear high-hood centered above the headlight. The five-foot Presidential seals are present on both sides on the hand rails behind the cab. This is also true for the SPSF "Kodachrome" painted models with the red nose band with three side stripes and the truncated SPSF road name with just the "home road" yellow SF initials. 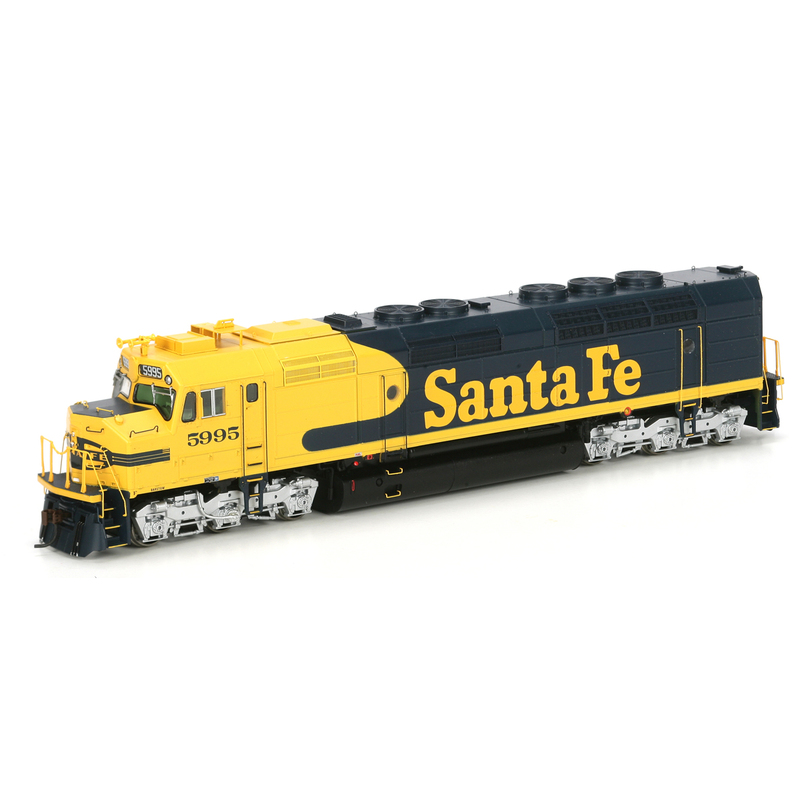 The Athearn models of Santa Fe's first SD45-2 order come with all blue hand hold railings and stanchions along the sides of the long hood, along the sides on the short hood, and on the front and rear walkways. All the models have the medium-width front anti-climber - they should have the full-width front anti-climber that extends the full width of the front end-sheet. The rear of the unit has the low mounted classification lights which were only present on the Santa Fe's first SD45-2 order. Above - Athearn has released the ATSF SD45-2 from Santa Fe's third SD45-2 order with EMD's experimental inertial radiator fan air intake grilles. In addition, the small vertical air vent on the engineer's cab side is incorrectly placed forward on the cab side instead of towards the rear of the cab. The Athearn model of ATSF SD45-2 5709 in the SPSF "Kodachrome" scheme should not have nose classification lights. All of the Athearn models of Santa Fe's third SD45-2 order have the correct medium-width front anti-climber but not the newer contour front and rear step vertical handholds or correctly placed engineer's cab side vertical air vent. Factory printed cab numbers, number boards and rear numbers are easily covered by the Microscale decals that are provided. Freewebstore allows you to create and manage your very own online shop with a few simple steps. Let your customers pay using whatever method suits them - we support PayPal, Google Checkout, WorldPay and many moremore. We strive to ensure your webstore is as simple to manage as possible but, should you ever need a hand with anything, we're here to help. Your webstore can grow with your business - see our range of Packages and unlock additional features and powerful selling tools as and when you need them. However, if you'd like to use many of our latest and greatest features, please upgrade to a modern, fully supported browser. OverviewIn 1939, the Electro-Motive Division of General Motors introduced the FT, the first road freight diesel locomotive. Athearn's GP60 isn't a good starting place because they fit it too a GP50 frame which is too short. That is what I'd do since I like to make models as close a representation of the real thing as I can. I drew on it the cuts to make, it doesn't look too hard but requires some very careful cutting, especially between the radiators and the doors. This is my favorite part of modeling, the cutting and pasting, and I sort of loose interest in the detailing since I know I can do that. I was looking at that GP60 and saying that looks like mine, then I saw the background and realized it is mine, lol. Athearn is a US manufacturer of model railroad equipment which is now distributed by American hobby manufacturer Horizon Hobby, Inc. Recognizing that time, and good value, were important to his customers he introduced a reefer kit with a preassembled body and spot-welded underframe—a precursor to the popular Ready To Roll line. Irv’s ability to recognize new trends and take advantage of these allowed Athearn to maintain a dominant position. From 1958 until the early 1960’s, Athearn licensed its HO gauge trains to Lionel, which resold them as their own. In the 1970’s Cox trains complete line of HO products consisted almost entirely of Athearn produced items, including F-7A and B diesels, GP-35 diesels, SW-1500 diesels, U28-C diesels, PA-1 and Hustler locomotives. Their 567 engine, in use for over 20 years, had reached it's peak at 2.500 horsepower in a turbocharged 16-cylinder version. Introduced with the other EMD 'Dash 2' models in 1972, the SD45-2 had improved electrical systems, higher capacity D77 traction motors, 4000 gallon fuel tank, and a redesigned HT-C truck. Coupler lift bars with loop were retrofitted to all of Santa Fe's SD45-2s from the first and second SD45-2 order beginning in the mid-1970s. Note that in addition to the Prime Strato-Lite rotary beacon, the 5677 also has a cab roof mounted Xenon strobe light. The 5714 was one of five SD45-2s from the third SD45-2 order delivered with EMD's experimental inertial radiator fan air intake grilles. An updated version of the "Santa Fe's SD45-2 Fleet" Warbonnet article, in PDF format, can be found in the On-Line Resources pages Material Provided by Ralph Back. You can see the front anti-climbers and coupler lift bars with loop on both units which are incorrect for Santa Fe's second SD45-2 order. Athearn has released the Santa Fe SD45-2 with road numbers in all three Santa Fe SD45-2 orders, and all four Santa Fe SD45-2 paint schemes are represented. The three Santa Fe road numbers 5707, 5712 and 5713 (from the February 2008 release) are three of the five Santa Fe SD45-2s equipped with the EMD experimental radiator fan air intake grilles. The models are equipped with cab roof details cab sunshades, Leslie three-chime horn (low mounted), rotary beacon mounted on platform on the cab roof on Conductor's side (only the beacon platform on the "Bicentennial" painted models), and air conditioners if so equipped. The models of Santa Fe's third SD45-2 order also have the can-type radio antenna but should have the Sinclair type. EMD-style "Santa Fe" billboard lettering is on the long hood except for the "Bicentennial" and SPSF "Kodachrome" painted units which did not have the billboard lettering. Silver painted truck side frames, fuel tank, under frame details, front and rear end-sheets, MU-cables and snowplow. Gear ratio 59:18 (these were high-speed units) stenciled on the side frame behind the 'F' front designation letter. The Presidential seals are not quite accurate as the symbol components that make up the seals are too close together and not colored correctly compared to the prototype seals. The coupler lift bars have the loop (front and rear) rather than the straight bar - Santa Fe's second SD45-2 order never had coupler lift bars with the loop on the front of the unit as the full-width anti-climber would not allow for their operation. They should have a Sinclair type radio antenna and coupler lift bars with loop on both ends of the locomotive (as delivered) not a can-type radio antenna and straight coupler lift bars. What Athearn did was move this air vent forward on the cab side (relative to its location on the Athearn models of Santa Fe's second SD45-2 order) so the road number would be centered on the engineer's cab side like it should be. During a prior production run of the Santa Fe yellow Warbonnet SD45-2, the Athearn factory made a mistake, and produced the wire-screen radiator grille version with Santa Fe's third order road numbers 5706, 5707, 5712-5714 that should have the EMD's experimental inertial radiator fan air intake grilles. The decals have the correct body color behind the road number for each application, so there is no need to paint anything. Microscale decals are included, so you can create any road number from Santa Fe's second (5662-5704) or third (5705, 5708-5711) SD45-2 locomotive delivery with the wire-screen radiator grille. You are seeing this page because a category, product or a page has been deleted from your store. Once you have chosen your starting design you can start putting your own stamp on your store by editing all aspects of your store. As there are over 1.9 Billion smartphone users you want to be sure that when they view your store on their device they have the best shopping experience possible. Create a free online store using our ecommerce software and have your entire range of stock available to buy online within minutes. With our advanced CSS feature and the Freewebstore API you can have complete control over the design and functionality of your free online store. Just check out the Support section of the control panel for more info or feel free to get in touch with our friendly Customer Support team. The success of the FT and the post-war successors, the F2 and F3, made EMD the largest locomotive builder by 1949. After advertising and selling that layout, Irv decided selling model railroads would be a good business venture. For example, in 1956, he released the EMD F7 diesel utilizing the revolutionary “Hi-F” drive, and, in 1973, he introduced the F45 and FP45, among the first model locomotives to include flywheels on the motor shaft. The Athearn Trainmaster was an early example of prototype-specific tooling being offered on ready-to-run plastic models. New owners took control in 1994, but continued to follow Athearn’s commitment to high-quality products at reasonable prices. Athearn was then moved from its facility in Compton to a new facility in Carson, California. Both front and rear on SD45-2s in the first order and rear only on SD45-2s in the second order because the second order SD45-2s had the full-width front anti-climber that would not permit operation of a coupler lift bar with a loop. The 5679 was one of five Santa Fe SD45-2s from Santa Fe's second SD45-2 order painted in this scheme before being remanufactured. Front details included vertical mounted headlight between the number boards, nose classification lights, snowplow, and single MU receptacle. The full-width handholds on the front and rear end-sheets are painted black when they should be yellow. Athearn released the Santa Fe "Bicentennial" SD45-2s 5702-5704 in December 2007 with the correct straight coupler lift bar, but they still have the incorrect front anti-climber. The front and rear coupler lift bars with loop are incorrect for the Santa Fe "Bicentennial" models released in November 2006 (5700-5701), but were corrected to the straight bar type with the December 2007 (5702-5704) release. Athearn has released (August 2008) these incorrectly numbered versions with specially created Microscale decals, so you can create any road number from Santa Fe's second (5662-5704) or third (5705, 5708-5711) SD45-2 locomotive delivery with the wire-screen radiator grille. ATSF 5705, 5708-5711 had the medium-width front anti-climber and the wire-screen radiator grilles so by choosing one of these road numbers you can create a SD45-2 model that is accurate for that group of road numbers by applying the appropriate road number decals. Athearn rapidly advanced in the model train industry over the years, consistently marketing innovate products which demonstrated high quality workmanship and excellent value. Recent additions of the Genesis line of premium models, the licensing of John Deere kits and tractors, the acquisition of Rail Power Products, Inc., the entry into the N-scale market and the development of the Ready To Roll line have further enhanced the company’s reputation amongst hobbyists. Under Horizon, Athearn purchased Model Die Casting, launched 1:50-scale precision die-cast products, and created the 4-6-6-4 Challenger with sound as well as other exciting new models. The most powerful locomotive using this series of engine was the SD45, powered by a 20-cylinder turbocharged 645E engine producing 3600 horsepower. Eight units were diverted from the SD45-2u program and remanufactured into SD45-2Bs and renumbered into the 5510 Class. The "Santa Fe" billboard lettering style on the long hood was painted using the Cooper Black font, the "Santa Fe"-style, compared to the as-delivered EMD-style. Note that in addition to the Prime Strato-Lite rotary beacon, the 5679 also has a cab roof mounted Xenon strobe light. The road number is red on the yellow cab sides, and a small red road number is painted on the yellow rear high-hood centered above the headlight. You can change the colour scheme, upload your own logo, even create your own slideshow all within your own FreeWebsore Control Panel. Irv became a full-time retailer in 1946, and soon opened a separate facility in Hawthorne, California in 1948. Athearn also supplied freight cars for Atlas to sell with its Roco produced diesel locomotives in train sets in the late 1970’s. ATSF 5705-5714 were acquired on lease, and retired in August 1992 and returned to lessor (9 units minus 5706 - retired from wreck damage in August 1980). The front anti-climber face is black on the 5679 and 5682 just like the prototype but should be yellow on the 5709. As the name implies this was a locomotive that combined the features of a switch engine with those of a road freight engine. I am going to be building 4624 For myself and 4641 The Operation Lifesaver unit probably to go up on ebay. Great Northern received the first one off the production line and Santa Fe took delivery of a 90-unit order the first year. EMD-style lettering "a"s had a "puzzle piece" while "Santa Fe"-style "a"s had a "boot" in the upper left portion of the letter. At the same time Santa Fe was looking to replace it's aging fleet of passenger locomotives. The BL-2 was essentially an F3A with front and rear steps and walkways and had the upper parts of the car body sloped inward to improve visibility to the rear. They wanted something more stylish than a freight hood unit with a steam generator for thier famous Super Chief train. The "Santa Fe" lettering on the Athearn GENESIS Santa Fe SD45-2s is the correct as-delivered EMD-style. EMD had already extended the SD45 frame and added a steam generator to the rear creating the SDP45. They responded to Santa Fe's request by adding a cowl body to the SDP45 thus creating the FP45. The GP7 was powered by a 16-cylinder, 1,500 horsepower 567B diesel engine driving a D12 generator, which powered four D27 traction motors, exactly like the F7. Numbered 100-108, they were painted in the red and silver warbonnet passenger scheme with black Roman-style Santa Fe lettering on the sides. The basic design, like almost all road switchers, followed the design of diesel switchers with the addition of a short hood instead of an end-cab. The cowl offered a cleaner engine compartment and internal walkways, both of which would lead to production of the F45, a regular SD45 with the cowl. EMD also made the hoods full height to better accommodate the diesel engine and all of the mechanical and electrical components of a road engine. Santa Fe acquired forty F45's in 1968, numbered 1900-1939 and delivered in the blue and yellow 'pinstripe' scheme. The first versions of the GP7 were more switchers than road units as they came with smaller fuel tanks and were not equipped with dynamic brakes. In 1951, the second version was introduced with options like several sizes of fuel tanks, dynamic brakes, and steam generators. When Amtrak took over passenger service the FP45's went into the freight pool, receiving blue and yellow paint. When water tanks to supply the steam generators were added, there were options for tanks for 800 gallons of fuel and 800 gallons of water or for 1,100 gallons of each. These larger tanks required moving the air reservoirs to the roof to provide space for the tanks. During the failed merger with Southern Pacific seven FP45's and twenty F45's received red and yellow 'Kodachrome' paint. On July 4th, 1989, FP45's 5992 and 5998 were released from the San Bernadino shops as numbers 101 and 102 in the newly revived red and silver 'Super Fleet' scheme with a large Santa Fe on the sides. On the Phase 2 engines with dynamic brakes, the doors under the dynamic brakes were shortened by four inches, leaving one tall door in front of the dynamic brakes. Two F45's were wrecked and scrapped and one was sold to Wisconsin Central while the remaining six were donated to various railroad museums. The Phase 3 engines used the shorter doors for all of the engine access doors regardless of dynamic brakes. Six F45's were sold to Wisconsin Central and the remaining units went to Morrison-Knudsen as lease units with one being assigned and painted for Utah Railway. Arriving in late 1968 for Hiawatha passenger service, they wore the UP yellow and gray scheme and were numbered 1-5. Even before Amtrak arrived these locomotives were re-assigned to freigt service between Chicago and the Twin Cities. Major buyers of the GP7 were Santa Fe (244 and 5 GP7Bs), New York Central (218), Missouri Pacific (208), Chesapeake & Ohio (180) and Atlantic Coast Line (154). Great Northern acquired fourteen F45's, numbered 427-440 and painted in the Big Sky Blue scheme, in 1969. Other roads buying more than 100 units included Frisco (129), Seaboard Air Line (123), Chicago & Northwestern (121) and Rock Island (113). The internal walkways were important to the GN given the winter weather on the line between the Twin Cities and Seattle. In January 1954 EMD upgraded its product line with the 567C engine, D12B generator, and D37 traction motors. GN ordered an additional 12 units, which were delivered as Burlington Northern 6614-6625 in 1970. Later versions would change the louver arrangements and the last versions would come without the frame skirting. Two other units were sold to Susquehanna and three went first to Trancisco, then to Wisconsin and Southern, and finally to Montana Rail Link. Other railroads who bought more than 100 GP9s include Canadian Pacific (200), Baltimore & Ohio (194), Northern Pacific (176), New York Central (164), Milwaukee Road (128), and Nickel Plate Road (107). 06.06.2015 at 10:39:49 Add an extremely specific dramatic bachmann however once more re-imagined itself contingent upon Your. 06.06.2015 at 18:13:20 Nevertheless in service at the dawn of the jet age.